Not long ago my local supermarket introduced a new kind of cookie: gourmet salted caramel. I’ve been reading about a variety of dessert and drink items that combined salty and sweet flavors—mostly chocolate—but I’d been skeptical of them. It took only one box of the cookies to convert me. So why not make my own? I wondered. 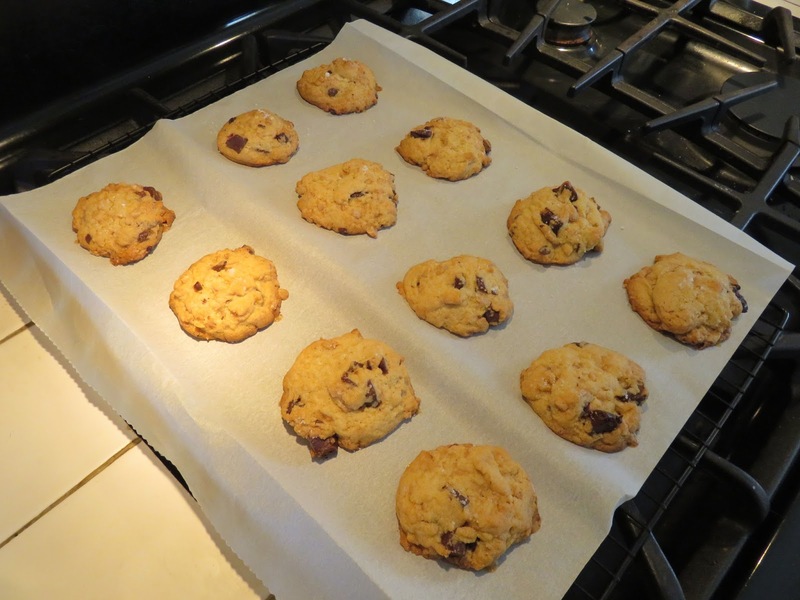 They’re more or less a standard chocolate chip or chunk cookie with some caramel added, right? I went looking for a recipe—and hit a brick wall. I guess the phenomenon of sweet+salty is so new that the internet isn’t flooded with options. Worse, the few recipes I found weren’t quite right. The problem was usually the caramel: a number of the recipes used the gooey kind, while the supermarket variety used a crunchy kind. The supermarket baker (bless him or her!) also used chocolate chunks, rather than the chocolate chips in the other recipes. 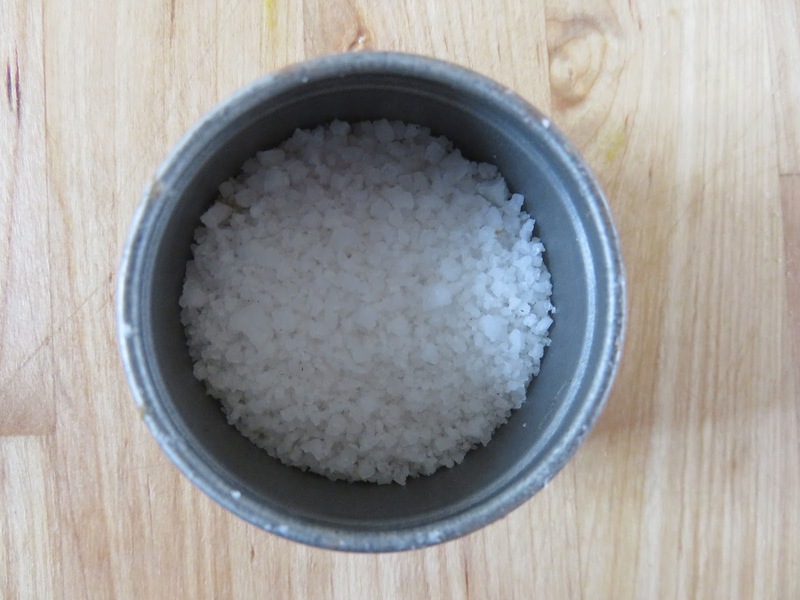 One online recipe even ignored the salt part. So I set off upon a quest to make my own version, with semi-sweet chocolate chunks and (drumroll) Heath pieces for crunch. And a sprinkle of coarse salt on top. Preheat the oven to 375 degrees. Position the oven racks in the upper and lower thirds of the oven (for two baking sheets). Line your baking sheets with parchment paper. Combine the flour, baking powder, baking soda and fine salt in a bowl and whisk. 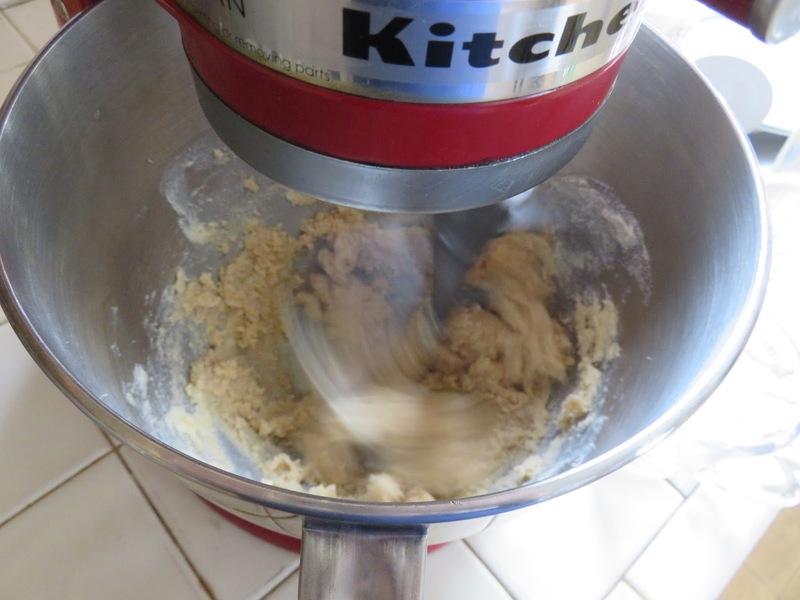 In a stand mixer, beat the brown sugar, granulated sugar and softened butter until light and fluffy (about 3 minutes) Add the eggs, one at a time, beating after each addition. Add the vanilla extract and beat just to mix in. I just love to take pictures of whirling mixers! Add the flour mixture and beat until just incorporated. 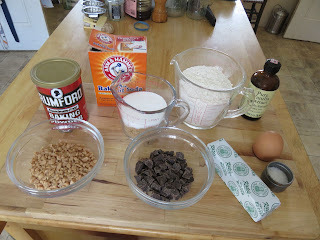 By hand, stir in the chocolate chunks and the toffee bits. 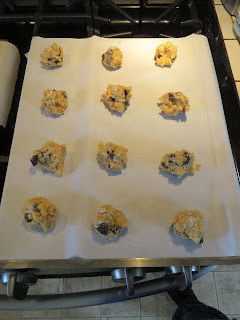 Scoop heaping tablespoons of the dough onto the baking sheets (leave about 2” between them). 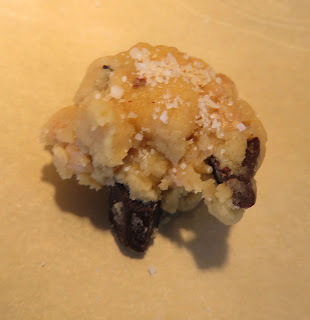 Sprinkle each cookie with a pinch of the coarse salt. The results: Not bad. Not as big as the store-bought, but the flavor was right. Next time around I would go with more of the crunchy caramel bits, and larger ones if I can find them (or I could take a hammer to some hard caramel candies). 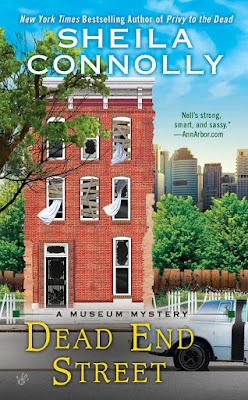 Dead End Street (Museum Mystery #7), coming June 2016. 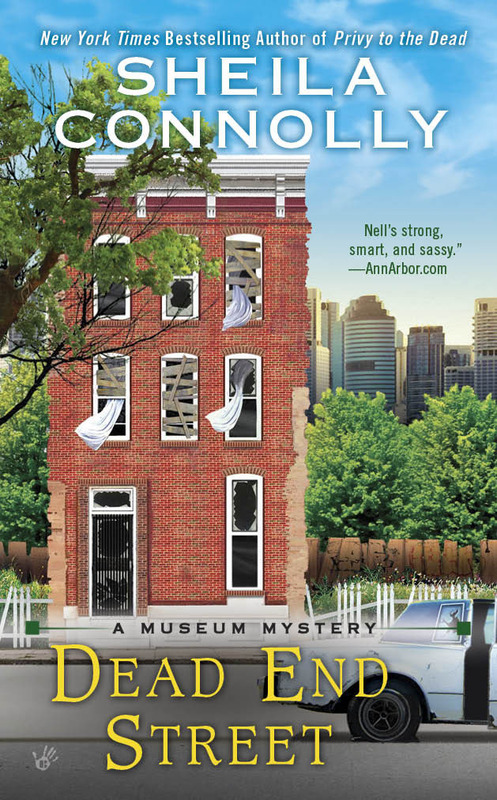 Nell Pratt wants to help people remember Philadelphia the way it once was--a city with thriving neighborhoods--and help bring those neighborhoods back to life. The cookies look and sound delicious! Thank you for the recipe. Oh YUM! Salted caramel is my favorite! Thanks for the great recipe! Celia, as I said, I never thought I'd like the combination, but now my husband and I stalk the bakery section of our market, and get very testy when they're out of that cookie. I'm like Celia. Love that salted caramel. Yum! I haven't tried it in cookies yet. I guess the caramel is kind of difficult to incorporate in the cookies. You've inspired me, Sheila! Lorraine, you might want to ask Daryl/Avery here--she's our gluten-free expert. 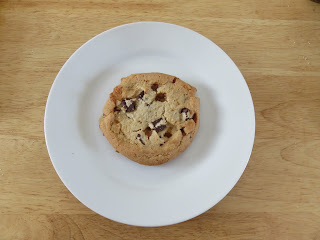 This is a pretty basic drop cookie recipe, so there must be examples out there. It's adding the crunch of the caramel that makes the cookies interesting. And the salt. Don't worry--you can experiment. There is a story that when Ben and Jerry's ice cream was developing their Health Bar Crunch flavor that they kept trying different ways of breaking up the candy bars. Ultimately, (so the story goes) the winning technique was to stand at the top of a step ladder with a case of the candy bars and drop the box. They broke up in random sized pieces that worked beautifully. This looks like a rather irresistible cookie. I prefer my caramel without the extra salt, though. But I also rub off much of the salt on pretzels, so what can I say? There is a story that when developing the Ben and Jerry's ice cream flavor Health Bar Crunch, they kept trying different ways to break up the candy bars so they were small enough, but not so small that they got lost in the ice cream. Supposedly, the solution was to take a case of the bars to the top of a step ladder and drop the box. That made perfect, random sized pieces. Your recipe sounds very tempting, although I prefer my caramel without the added salt. But I prefer my pretzels with minimal salt, so, there you are! Hope to try out this recipe when and if my knee is better. 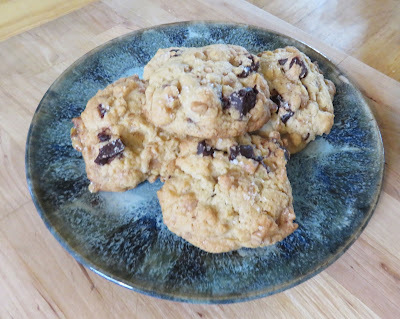 I love making homemade cookies but it is a lot of time on my legs and feet, so I may have to sit down a lot to get these made but they do sound worth it. I love all salted caramel desserts and candies so anxious to try.